I'm learning Aspect Oriented Programming concepts and Spring AOP. I'm failing to understand the difference between a Pointcut and a Joinpoint - both of them seem to be the same for me. A Pointcut is where you apply your advice and a Joinpoint is also a place where we can apply our advice. Then what's the difference? What can be an example of a Joinpoint? Joinpoint: A joinpoint is a candidate point in the Program Execution of the application where an aspect can be plugged in. This point could be a method being called, an exception being thrown, or even a field being modified. These are the points where your aspect’s code can be inserted into the normal flow of your application to add new behavior. Advice: This is an object which includes API invocations to the system wide concerns representing the action to perform at a joinpoint specified by a point. 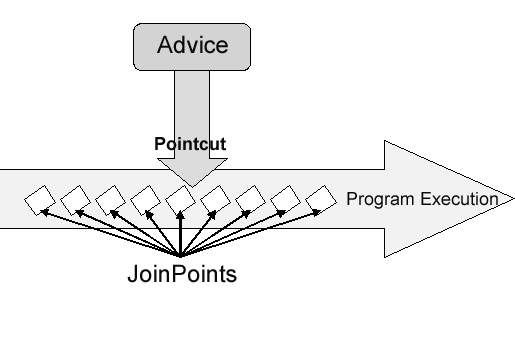 Pointcut: A pointcut defines at what joinpoints, the associated Advice should be applied. Advice can be applied at any joinpoint supported by the AOP framework. Of course, you don’t want to apply all of your aspects at all of the possible joinpoints. Pointcuts allow you to specify where you want your advice to be applied. Often you specify these pointcuts using explicit class and method names or through regular expressions that define matching class and method name patterns. Some AOP frameworks allow you to create dynamic pointcuts that determine whether to apply advice based on runtime decisions, such as the value of method parameters. The following image can help you understand Advice, PointCut, Joinpoints. When you go out to a restaurant, you look at a menu and see several options to choose from. You can order one or more of any of the items on the menu. But until you actually order them, they are just "opportunities to dine". Once you place the order and the waiter brings it to your table, it's a meal. Joinpoints are options on the menu and Pointcuts are items you select. A Joinpoint is an opportunity within code for you to apply an aspect...just an opportunity. Once you take that opportunity and select one or more Joinpoints and apply an aspect to them, you've got a Pointcut. To understand the difference between a join point and pointcut, think of pointcuts as specifying the weaving rules and join points as situations satisfying those rules. Pointcut defines rules saying, advice should be applied on getName() method present in any class in any package and joinpoints will be a list of all getName() method present in classes so that advice can be applied on these methods. (In case of Spring, Rule will be applied on managed beans only and advice can be applied to public methods only). Pointcuts: Pointcuts are something like regular expressions which are used to identify joinpoints. Pontcuts are expressed using "pointcut expression language". Pointcuts are points of execution flow where the cross-cutting concern needs to be applied. There is a difference between Joinpoint and Pointcut; Joinpoints are more general and represents any control flow where we 'may choose to' introduce a cross-cutting concern while pointcuts identifies such joinpoints where 'we want to' introduce a cross-cutting concern. Layman explanation for somebody who is new to the concepts AOP. This is not exhaustive, but should help in grasping the concepts. If you are already familiar with the basic jargon, you can stop reading now. Assume you have a normal class Employee and you want to do something every time these methods are called. these methods are called JoinPoints. We need a way to identify these methods so that the framework can find the methods, among all the classes.methods it has loaded. So we will write a regular expression to match the signature of these methods. While there is more to it as you will see below, but loosely this regular expression is what defines Pointcut. e.g. First * is for modifier public/private/protected/default. Second * is for return type of the method. The combination of these two is called Advice. As you can imagine, you would have to write a function to be able to do #2. So this is how it might look like for the basics. Note: For clarity, using word REGEX instead of the * * mypackage.Employee.get*(*). In reality the full expression goes into the definition. Once you start using these quite a bit, you might end up specifying many @After/@Before/@Around advices. The repeated regular expressions will eventually end up making things confusing and difficult to maintain. So what we do, we just give a name to the expression and use it everywhere else in the Aspect class. Comparing an AOP language like AspectJ to a data query language like SQL, you can think of joinpoints (i.e. all places in your code where you can weave aspect code) as a database table with many rows. A pointcut is like a SELECT stamement which can pick a user-defined subset of rows/joinpoints. The actual code you weave into those selected places is called advice. Both pertain to the "where" of aspect-oriented programming. A join point is an individual place where you can execute code with AOP. E.g. "when a method throws an exception". A pointcut is a collection of join points. E.g. "when a method in class Foo throws an exception". Join point: a point during the execution of a program, such as the execution of a method or the handling of an exception. You can consider Joint Points as events in execution of a program. If you are using Spring AOP, this even is limited to invocation of methods. AspectJ provides more flexibility. Pointcut: a predicate that matches join points. Advice is associated with a pointcut expression and runs at any join point matched by the pointcut. * @author Amanuel Nega on 10/25/16. ExampleBusinessClass when proxy-ed, is our target! JoinPoint: Joinpoint are points in your program execution where flow of execution got changed like Exception catching, Calling other method. PointCut: PointCut are basically those Joinpoints where you can put your advice(or call aspect). So basically PointCuts are the subset of JoinPoints. I agree with mgroves.. A point cut can be considered as a collection of multiple joint points. Joint point specify the particular location where the advice could be implemented, where as pointcut reflects the list of all joint points. A pointcut is defined on the Aspect - class implementation. The point cut basically refers to the pointcut expression within the advice. Joint point is the actual method invocation, which joined the method in package "app.purchase2.service.impl" to the method in aspect class "includeAddOns()". You can access properties of the join point with the org.aspectj.lang.JoinPoint class. So Advice is the cross-cutting logic implementation and Advisor is the advice plus the PointCut, if you use only advice spring will map it to advisor and make the pointcut TRUE which means don't block anything. That's why when you use only advice it is applied to all the methods of the target class because you didn't filter them. But Joinpoint is a location in the program, you can think about it like reflection when you access the Class object and then you can get Method object, then you can invoke any method in this class, and that's how compiler works, if you think like this you can imagine the Joinpoint. Joinpoint can be with field, constructor or method but in Spring we have joinpoint with methods only, that's why in Spring we have (Before, After, Throws, Around) types of Joinpoint, all of them refers to locations in the class. As I mentioned you can have advice with no pointcut (no filter) then it will be applied to all the methods or you can have advisor which is [advice + pointcut] which will be applied to specific methods but you can't have advice without joinpoint like pointcut, you have to specify it, and that's why advice types in spring is exactly the same types as the joinpoint so when you choose an advice you implicitly choose which joinpoint. To wrap up, advice is the implementation logic for your aspect to the target class, this advice should have a joinpoint like before invocation, after invocation, after throwing or around invocation, then you can filter where exactly you want to apply it using pointcut to filter the methods or no pointcut (no filter) so it will be applied to all the methods of the class. JoinPoint: It specifies a point (method) in application where Advice will be executed. Pointcut: It's a combination of JoinPoints, and it specifies that at which JoinPoint Advice will be executed. Not the answer you're looking for? Browse other questions tagged spring aop aspectj spring-aop pointcut or ask your own question. Dependency Injection & using interfaces? What is difference between Spring interceptor and AOP?